What life needs is not perfection, but love. Not finding the perfect person, but learning to see an imperfect person perfectly! “So, you are not annoyed with me anymore?” asked Isha. “I didn’t say that!” Rosh grumbled. “The first to apologize is the bravest, you know,” she touched him lightly. “The first to forgive is the strongest. And the first to forget is the happiest." “By apologizing, forgiving and forgetting?” he asked her again. He did not respond, but he was listening. She was encouraged. “There is so much perfect around us, if we only care to see it. If we begin to see it, we can begin to move from one level of perfection to another level of perfection..."
He knew when he was defeated, but he wasn't ready to confess it so quickly. “Get in the line?” she was puzzled. "A man once saw a big crowd on the street,” he explained. "A very unusual funeral procession." 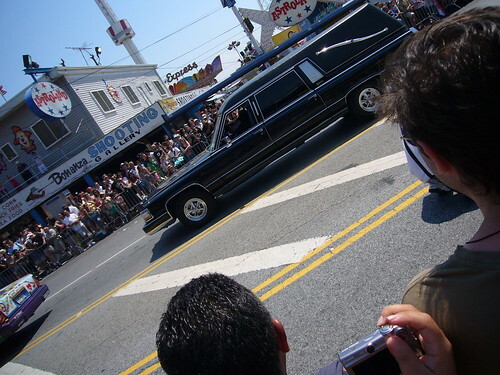 "One black hearse followed by another, about 50 feet behind the first one. Behind the second black hearse, a solitary man walking a dog on a leash. Behind him, a short distance away, were a few hundred men - walking single file." "He couldn't contain his curiosity." "Respectfully, he approached the man walking the dog and said, 'I am so sorry for your loss, and this may be a bad time to disturb you, but I've never seen a funeral like this. Whose funeral is it'?" "She yelled at me, and my dog attacked and killed her." "But who is in the second hearse?" the man inquired further. "My mother-in-law," the man answered. "She was trying to help my wife, when the dog turned on her too." A deep knowing silence briefly bonded the two men. "Wow!" said the suddenly inspired man. "Can I borrow your dog?" "Get in the line!" the man replied. Next Story: Auf Wiedersehen. Good Bye!